Yes and no. There are certainly action-packed, drama-filled, laugh-inducing Avengers tories out of umpteen thousand different Avengers issues Marvel has released over the decades, but few come close to the glossy sheen of the film. It’s a big challenge for Marvel, which frequently finds itself flat-footed when it comes to delivering the right comic into the hands of an inspired movie-goer. 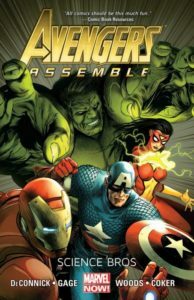 Enter Avengers Assemble – a comic Marvel pulled together in 2012 with the specific mandate of being friendly to the movie-loving audience headed from cinemas straight to their local comic book store. The first collection of issues #1-8 was a highly-enjoyable intergalactic romp written by Brian Bendis, but the universal scope of the adventure did more for capitalizing on Thanos’s split-second reveal in the credits of the movie than it did for matching the tone of the film. Enjoyable comics, but not exactly a sequel. Then there is the proceeding run of issues #9-13, by Marvel writer and Manga-adaptation vet Kellie Sue DeConnick, just released as a trade paperback called Avengers Assemble: Science Bros. It features the entire movie cast and the ever-awesome Captain Marvel and Spider-Woman – plus, a brief appearance from a peanut gallery of perennial favs, Spider-Man and Wolverine. The first story features a science squabble between big brains Tony Stark and Bruce Banner that could have easily occurred in the car they drove away in at the end of The Avengers. When a science-y mystery arises, they each pick one teammate to see who can solve it first. Stark, ever the competitor, picks Thor. 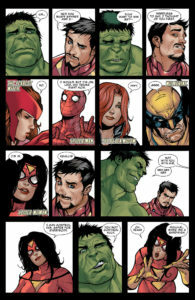 Banner, knowing his Hulk persona might need some minding, picks the beguiling Spider-Woman. The Captains America and Marvel wind up as team three, doing the fist-fighting dirty-work while the science bros embark on (and ultimately bungle) their initial mission. 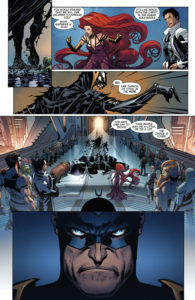 The second story finds a former victim of Black Widow calling in a marker – a chance for her to repay a bit of the red in her ledger. 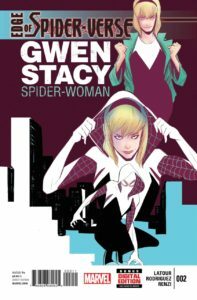 Against her wishes, both Hawkeye and Spider-Woman accompany her on the mission as an ongoing part of their ex-lovers’ spat. 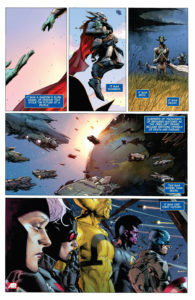 It starts as a simple search and rescue, but becomes more complex when the person the Avengers are rescuing turns out to have a different repayment in mind for Natasha’s sins of the past. This comic feels just like the movie, splitting it neatly in two halves between the super-powered members of the team and its more human side. 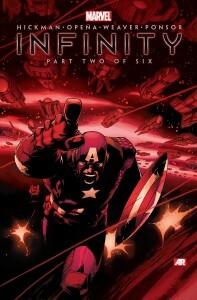 From the pointed banter between Stark and Banner, to Spider-Woman both taming and sympathizing with Hulk, to Captains America and Marvel shouldering the hard part of the mission, the first story reads like a natural extension of the film so perfectly that you can play it in your head as a direct sequel. The second story does that beautiful thing that comics can do – expanding a minor plot point of the movie to its own tale that deepens the backstory of a character. DeConnick navigates both stories with ease, proving that comics can be fun and funny, and entertaining while being appropriate for readers of all ages. 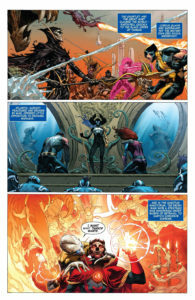 The artwork isn’t the cinematic, lifelike stuff of some of Marvel’s go-to talents, but it’s bold and engaging throughout. That’s especially true of Stefano Caselli on the first story – he needs a regular Marvel gig, pronto! CK Says: Buy it! 4.5 out of 5 stars.